An estimated 12 million people and families in Vietnam are affected by disabilities, with the resulting human, social, and economic costs to society often exacerbating the poverty that causes or accompanies disability. We assisted the Vietnamese to provide more comprehensive care, treatment, and specialized assistance to people with disabilities, beginning in Danang Province. Building on more than 20 years of disability assistance in Vietnam from the U.S. Agency for International Development (USAID), this program supported the implementation of the Danang disability action plan, worked closely with the departments responsible for carrying out the plan to ensure that there was local government ownership of providing services for the disabled. Build an integrated case management, social work, and referral system that will be sustained by local government. Improve the quality of and access to specialized services in rehabilitation, education, employment/livelihoods and social service. Enhance public health services to improve the systems for birth defects, postnatal newborn screening, and cancer surveillance. Strengthen pre-pregnancy (preconception) services such as medical checkups, nutritional support, and information on avoiding exposure to environmental contaminants. 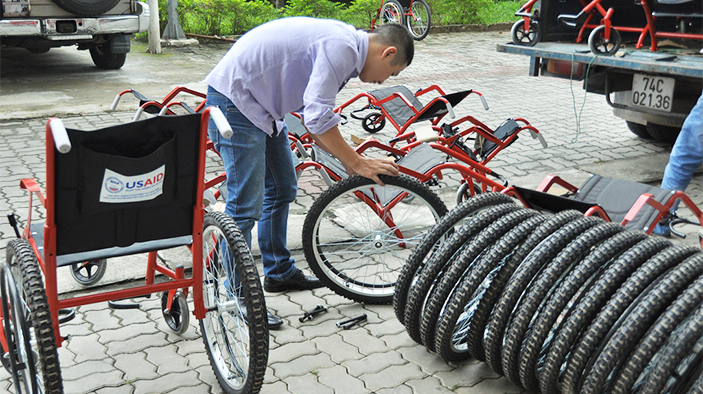 Nearly 650 people with disabilities participated in social, education, and sports events in Danang and Dong Nai on Vietnam Disability Day in April 2013; and nearly 600 people with disabilities from Danang participated in an International Disability Day event in December 2013. More than 450 children with disabilities have received scholarships. More than 830 people with disabilities have received clinical examinations for physical therapy, prostheses/orthoses, wheelchairs, or hearing aids. Almost 300 people with disabilities have received assistive devices such wheelchairs, walking canes, hearing aids, standing frames, and prostheses. Nearly 230 community government employees in Danang received training in disability classification and determination as required by the new Disability Law. About 330 service providers from different local agencies in Danang attended an orientation workshop in December 2013.